Yesterday's storm wasn't fierce enough to keep Barb Marx, the president of The Beatles' official Canadian fan club from my door bright and early, carting with her lots of Beatles memorabilia. 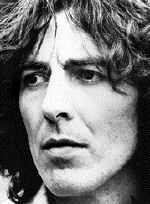 The reason for her visit is that George Harrison would have turned 60 on Feb. 25, and Barb has organized a celebration at the Brunswick House on Friday night, featuring Go Freddie Go, a local band that has a lot of Beatles music in its repertoire. But let's get something straight first. "Wait a minute," Barb says. "His birthday's not Feb. 25, although that's the date George's mom celebrated it when he was a kid. But in his late 50s, when applying for a copy of his birth certificate, George discovered his actual birthday was Feb. 24." Barb is obviously an expert, so we should take her word that today is the real anniversary of George's birth. She says she expects a full house on Friday to honour George because everyone has warm feelings for this low-key Beatle, who died on Nov. 29, 2001. "He was the kindest Beatle," says the die-hard fan, who has been a big Beatles supporter since their earliest days. George, she points out, was the first musician to hold a rock concert for charity (for Bangladesh in 1970). He was also the most spiritual through his involvement with Hare Krishna (he asked that his ashes be scattered in the Ganges). Barb has been the president of the Canadian fan club since 1990 and publishes a newsletter, The Beatles Core Magazine. She says she has visited the hometown of her heroes many times. "It's very magical in Liverpool because you see all the places they wrote about: Strawberry Fields, Penny Lane, clubs they played in, houses they lived in." But it is obvious talking to her that Paul McCartney is her favourite and she keeps up with all the news involving him. How much does Barb love Paul? "I've had recent dreams about him," she says laughing, adding her partner, Joe Foresi, another Beatles fan, takes it all in stride. I ask what she and other fans think of Paul's marriage to Heather Mills. Barb is blunt in her response. "We do think [she did it] for the money." I remind her that Mills recently made a statement in which she said the negative press surrounding her relationship with Paul has been more painful than losing her leg years ago in a motorcycle accident. But Barb isn't swayed: "Heather came out publicly and said she didn't know any Beatles tunes. Give me a break, she's British." Of Linda, Barb sniffs, "She's more popular posthumously." I get the feeling it wouldn't matter if Paul had been married to Mother Teresa, she wouldn't have measured up in Barb's eyes. But the fan-club president has good gossip about Stella McCartney, Paul's designer daughter, and Heather. "They hate each other," she says. "Stella got married three weeks ago and Paul didn't even go to the wedding. He was on his way to India with Heather when the wedding took place. Heather wasn't invited. Stella wanted her father to walk her down the aisle, but he wouldn't go without Heather." Barb says she has a friend, Tina, who works at The House of Blues in Los Angeles who follows Paul everywhere. But Paul isn't her only brush with fame. "Tina told me she was working at The House of Blues the night the now infamous Phil Spector met Lana Clarkson, the woman he is accused of murdering [Clarkson also worked at The House of Blues]. Tina told me she had gone up to Spector and said, 'I really admire you.' A few hours later, he was charged with murder." Barb tells me about her own brush with fame when she met George Harrison at the Tokyo airport in 1991. "I went to see him [and Eric Clapton] in concert at the Tokyo Dome. I went to all three concerts." When she approached him at the airport, he was carrying carry-on luggage and a duty-free bag. He refused to give her an autograph because he had to board the plane. "Do you know why he did that tour? Because Eric Clapton's son, Connor, had died the year before [he fell out of a window] and Eric was devastated. George talked Eric into touring to help him forget the tragedy." "They were so close," Barb says of Eric and George, adding, "They even married the same woman, Patti Boyd." So she went all the way to Japan and didn't even get an autograph. That must have been dis- appointing. "Maybe that's why Paul's my favourite Beatle," quips Barb. To join the Beatles fan club call Barb Marx at 416-496-8575.